Premise sprays kill and repel flying insects in the stable and barn. 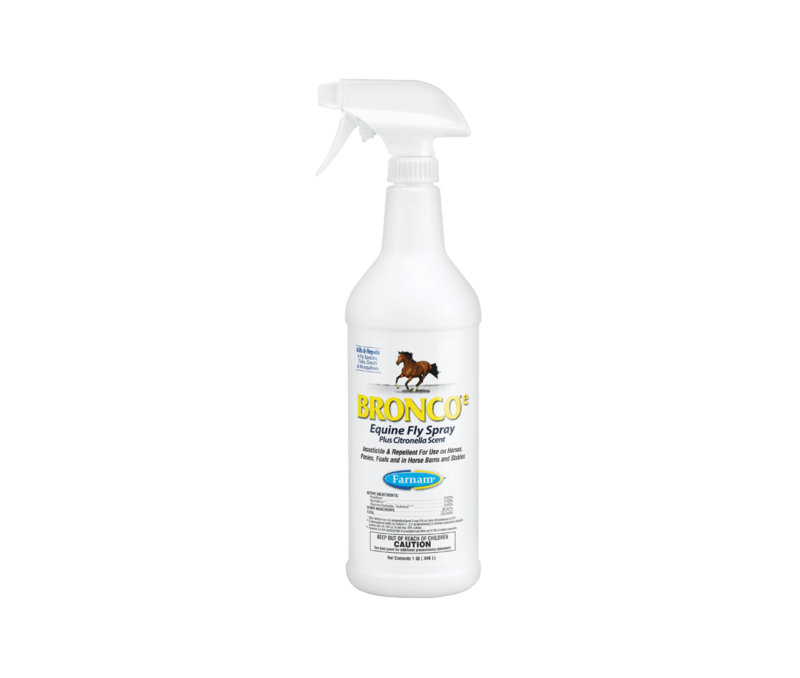 Bronco®e fly spray is an effective, water-based formula that can be used as a premise spray in addition to equine fly control. Directions for Wipe-On Use: Thoroughly brush horse to remove excess dirt and dust. Extremely dirty horses should be shampooed, rinsed, and allowed to dry before applying wipe. Use a sponge or clean soft cloth or mitt. Apply liberally over areas to be protected. Pay special attention to legs, belly, shoulders, neck, and facial areas. Avoid eyes and mucous membranes. To Kill and Repel Flying Insects in Horse Quarters: Use this product in horse barns and stables to kill and repel stable flies, horse flies, face flies, deer flies, house flies, horn flies, mosquitoes, gnats, ticks (including Deer Ticks), fleas, chiggers, and lice. Apply undiluted as either a surface spray or space spray (fog). Surface Spraying: Use a good sprayer adjusted to deliver a coarse wet spray. Apply as a coarse wet spray using 1 pint per 1,000 square feet. Direct the spray wherever flies congregate or alight, until surfaces are moistened. Treat around doorways, feed storage rooms, alleyways and windowsills. Spray around outside of door facings and screens to render area unattractive to insects. This helps to repel insects and prevent entrance into building. Space Spraying: Remove horses prior to application. Before application, close doors, windows and other openings and shut off ventilating systems to reduce air movement as much as possible. Apply with a good machine adjusted to deliver a fine mist or fog. Direct spray at an upward angle, distributing it uniformly throughout the entire area at a rate of 2 fluid ounces per 1,000 cubic feet (10 ft x 10 ft x 10 ft). Apply by directing spray toward ceiling and corners until the space is filled with mist. For best results, keep doors and windows closed, when possible, for 10 minutes during spraying and after application. Applicator must not remain in treated area. After the 10 minute treatment period, the area should be opened and ventilated prior to reoccupation by humans or animals.